In our last episode, we learned how to create an open source project on Google Code using avrtoolbox as an example [http://code.google.com/p/avrtoolbox]. We also learned how to manage the software versions using TortoiseSVN. This time, we'll look at the design philosophy for avrtoolbox, and a project C coding and documenting style guide. One of the things we intend for avrtoolbox (remember this is a we project — ‘collaborative’ and ‘open’) is that it will be usable by everyone interested in AVR microcontrollers — from the greenest novice to the most experienced professional. Oh yes, we are ambitious! We want an elementary library with tutorials designed for novices (someone who has never ever used a microcontroller or programmed in C) so they are easy to learn and use just like systems such as the Arduino or the BASIC Stamp. We want to build this elementary library from lower level libraries that can be easily expanded by advanced users who need professional quality AVR C programming tools. These goals may seem at odds — mixing novice and professional libraries in the same project — but they are actually just the ends of a programmer competence spectrum that doesn’t have any formal dividers. All real people are somewhere in between. Oh, and a word of warning. Most of what follows this episode is for avrtoolbox developers, so novices might want to skim a lot of this and consider it a sort of coming attractions featurette – but please do read the last section. avrtoolbox is a collection of open source educational tools for learning about and using Atmel AVR (eight-bit) microcontrollers with the standard Atmel AVR Toolchain: AVRStudio/WinAVR/avrdude. libraries – Useful C functions. avr_applications – Complete programs for the AVR. pc_applications – Terminals, IDEs, etc. hardware – Schematics and layouts. miscellaneous – Useful stuff that doesn’t fit elsewhere. Because the AVR architecture varies among sub-families, it would be very difficult to create compiled hardware libraries that could be run on all possible AVR variants. Our initial approach will be to create a single source code repository where all the code will be developed for and tested on three different AVRs available on inexpensive development boards. This will demonstrate concepts for writing code that can be compiled for multiple devices and leave it to the users to follow the methods shown to add additional devices as needed. For the Arduino board, this system does not use the Arduino IDE nor is it compatible with the existing Arduino libraries. The BeAVR – Breadboard enabled AVR – was shown in the May ‘10 Smiley’s Workshop. The lower level directory structures will evolve over time, but to begin, the libraries’ directory will have five subdirectories. elementary – High level simple functions similar to those in Arduino or PBASIC. general – Useful embedded system software that is not AVR specific. driver – AVR specific software. board – Custom functions for development boards such as the Butterfly. testers – Test software for each library. The term ‘library’ has a confused use with microcontrollers sometimes referring to source code listings and sometimes referring to object module archives. We hope to avoid confusion by using source library for the former and archive library for the latter. Archive libraries are the simplest to use. The user needs only to include the library in a project and think of the individual library functions as black-boxes promised to work as described by the API (Application Programmer’s Interface) document. These were discussed in the Jan ‘11 column. The source library is only intended for use by the avrtoolbox developers. However, the source code is made available to everyone since many folks will prefer to rip off, er, re-use the source in their own project rather than using the archive libraries. The reader should be aware that it is early in the evolution of avrtoolbox and changes will take place over time. However, we have to start somewhere so the planned directory structure with the library names will be shown on the home page of the avrtoolbox project and updated as libraries are completed. lower_case: Has all lower case letters, with words separated by underscores. UPPER_CASE: Has all upper case letters, with words separated by underscores. We will conceptually divide our code into public and private modules, functions, and variables. The public materials are meant to be used in archive libraries and are documented in the API and the .h file supplied with the library. The private materials are those used to build the libraries and are not intended for casual users. However, the source code is available for advanced users. Each module will have a short descriptive name such as spi or uart. Short module names is a subjective requirement with the example of spi_init() versus serial_peripheral_interface_initiation(). Public files will use lower_case and will have the module name as a prefix. For example: spi.c and spi.h. Private files will have the first letter of the module in UPPER_CASE: Spi.c. Public function names and arguments will all use lower_case and have the module name as a prefix: module_init(). Private functions will have the first letter of the module in UPPER_CASE: Module_init(). Module initialization functions will all have _init as a suffix. For example: uart_init(uint32_t baud_rate). Variable names will all use lower_case. Keep global variables to a minimum and make sure they are well justified and documented. Data typedefs use lower_case and end in _t (i.e., long_timer_t). Any member variables follow the guidelines for variables specified above. Public constants (in header files) use #define for single values because it will not reserve memory space. Private constants use static const values to limit the scope to the module. Constants will be UPPER_CASE and have the module name as a prefix. For example: #define UART_BAUD 19200. Whenever possible, use the read/modify/write paradigm to change registers in order to avoid overwriting other parts of the register. This is best done by using standard bitwise operator techniques. Although C has no “private” definition, any functions and otherwise global variables not meant to be used by client code should be declared static. Each module’s API is defined in a single header file, named after the module (i.e., uart.h). Documentation requirements vary with the type of user. A developer will be intimately familiar with the code and not need much other than the code itself. A maintainer should have the same level of programming skill as a developer, but will need information about the software that may not be obvious from reading the raw code. So, he will want in-line comments sufficient to help him quickly understand what the code is doing. A user may just want to use the functions and not care how they were generated, so all he’ll need is an overview of the module and the specifics of how to use each function – what goes in and what comes out. Generally speaking, he doesn’t care what happens in between. This leads to two conceptually separable types of documentation: in-line comments in the C source for the developer/maintainer, and a separate API document for the casual user. The developer should just use common sense and let the obvious things be self-documenting, while adding comments on things that might not be immediately obvious. The casual user will need a bit more handholding, so we will use Doxygen comments in the public header file to generate the API document and will try to anticipate the real needs of an average user. A big part of being organized is being able to identify what you’ve got. If you sort through the pile of papers on your desk and find three printed copies of widget.c, you’ll probably want to know which one is the most current so you can toss the other two. SVN provides lots of information attached to the digital file on your PC and in the repository, but none of that information is in the text of the file unless you specifically tell SVN to add it (which is what we will learn in this section). Is This the Latest Version of the File? 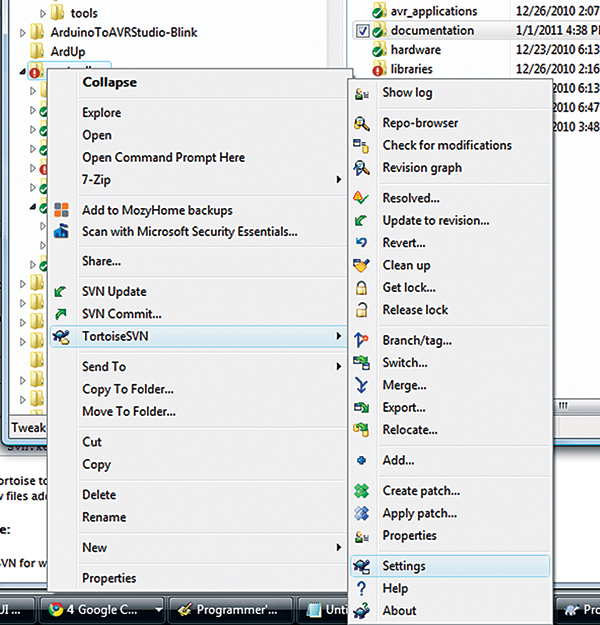 Select the avrtoolbox directory on your PC and right-click to open the TortoiseSVN menu. Then, select Settings as shown in Figure 1. Next, click the Edit button as shown in Figure 2. FIGURE 2. 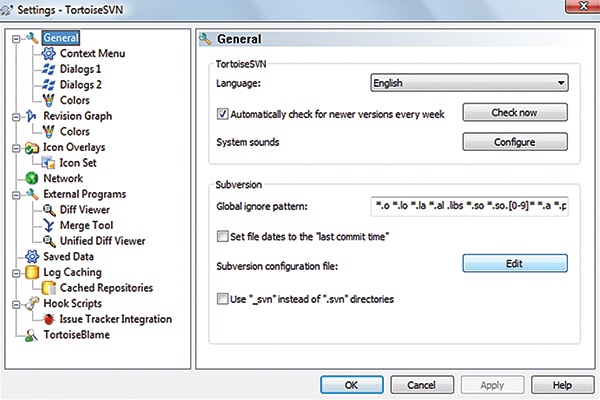 TortoiseSVN Select Edit Configuration. 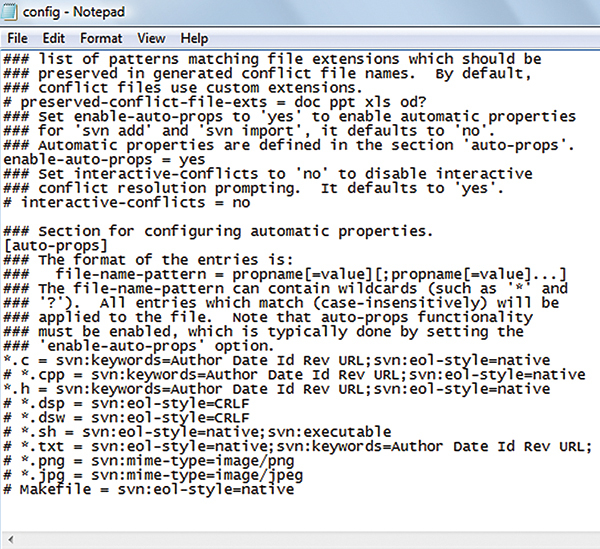 Finally, the configuration file will open in NotePad as shown in Figure 3. FIGURE 3. TortoiseSVN Configuration File. Now when you look at two files with the same name, you can see which is the most recent. where the YEAR has the year the code was first released and the AUTHOR NAME has the initial author’s name in both locations. Doxygen comments will only be used in the public header file that will contain complete Application Programmers Interface information for each public function. This is the only document that the library user needs. \image wave the flag for our team. \brief - that ‘brief’ly describes what the module does. Location: This is not a Doxygen command but will be included at the end of the \brief section to show the specific project location for this module. \todo notes on what remains to be done. \author – tells who wrote this function. \date – when it was first released. The /* ***…*** */ dividers to make the file more readable. /* ******************************************* */<br /> /*! 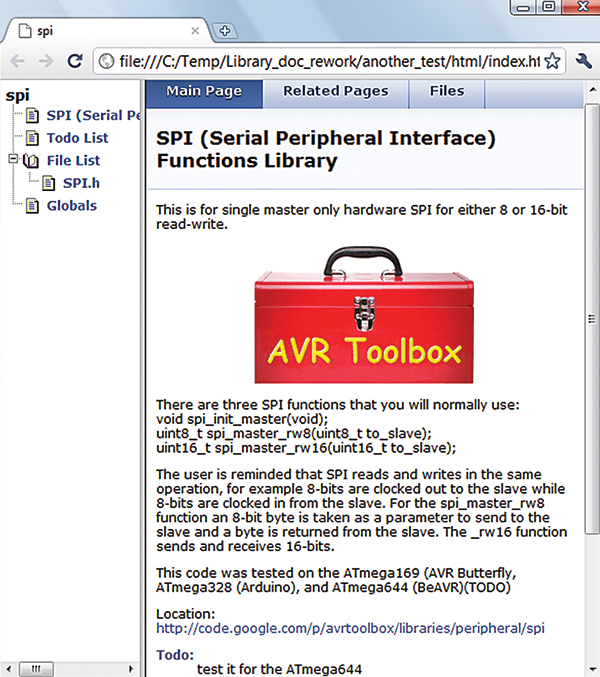 <br /> \image html avrtoolbox.gif<br /> <br /> \mainpage SPI (Serial Peripheral Interface)<br /> Functions Library<br /> <br /> \brief This is for single master only<br /> hardware SPI for either 8 or 16-bit<br /> read-write. The user is reminded that SPI reads and<br /> writes in the same operation, for example<br /> 8-bits are clocked out to the slave while<br /> 8-bits are clocked in from the slave. For the<br /> spi_master_rw8 function an 8-bit byte is<br /> taken as a parameter to send to the slave and<br /> a byte is returned from the slave. The _rw16<br /> function sends and receives 16-bits. This generates a Doxygen page as shown in Figure 4. FIGURE 4. spi API document. \brief — that ‘brief’ly describes what the function does. The final line will contain the avrtoolbox directory location for the module. \param — name data type and use for each parameter. \return — name data type and use for return value. \note — provides extra information that might prove useful. \todo — items that remain to be done. /* ******************************************* */<br /> /*! <br /> \brief Writes and reads an 8-bit byte via<br /> software SPI. \return 8-bit byte from the slave device. \param to_slave - 8-bit byte to send to the<br /> slave device. This lets Doxygen create the API text shown in Figure 5. FIGURE 5. spi API for a function. In the above case, stating the obvious that the \param and \return are eight-bit may be overkill, but it is used to differentiate between this function and the nearly identical 16-bit version of the function. These comments will be used by Doxygen to generate the avrtoolbox user manual. That process is explained elsewhere. I intend for the avrtoolbox to grow into a community-based tool that is not dependent on any individual. That is why I keep emphasizing we. I am taking the lead at the moment by writing this Workshop series and supplying the base code to get things going. Other folks have done similar projects in the past and then disappeared, leaving some really good tools laying around unsupported and with restrictive licenses. I want this project to be so useful that folks will continue to use it and keep it up-to-date even if I get run over by a truck. This will take a community that sees the value of the project and commits to helping out. If you are interested, please start a thread on www.avrfreaks.net and let’s start discussing what avrtoolbox can be and what you can contribute. Also, AVRFreaks is the place to go for questions about avrtoolbox and AVRs in general. Let’s assume for a moment that you are sincere with your question. My answer is OF COURSE PEOPLE WILL LAUGH AT YOU — THIS IS THE INTERNET! To make matters worse, AVRFreaks is a nearly unmoderated forum. We have folks here who will not only laugh at you, if you give them the opportunity they will give you advice that will kill you if you take it. The best way to succeed with microcontrollers is to grow a pair, and use the Internet and sites like AVRFreaks using the good and ignoring the bad. At times, it is like panning for gold in a stream of sewage but it is also the best way to get the gold. If you really are afraid of being laughed at on the Internet, you’ll just make your own life harder and the [expletive deleted]s win. Maybe that is harsh, but the Internet is just too good of a tool to give up over dainty sensitivity. So, I’m hoping some folks will put on their waders and gas masks, and join in the fun. I will generally look at posts on AVRFreaks when the title has avrtoolbox, Butterfly, or Smiley’s Workshop. I may not respond since AVRFreaks has members all around the world and someone usually beats me to providing a good answer. Also, don’t PM me. I participate in a community and public discussion is available to everyone who might have the same question, so I only need to answer it once.